If anyone has pioneered the visual language of skateboarding, it is Jim Phillips and Santa Cruz. Jim’s artistic style, paired with the equally loud personalities of the Santa Cruz pro team, bred some of the most recognizable skateboards in history. 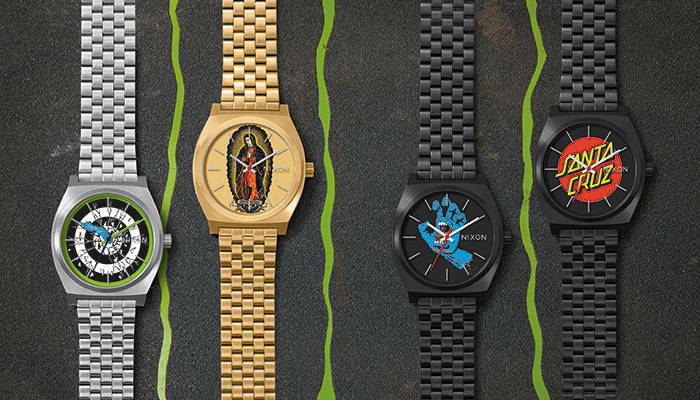 Nixon joins forces with Santa Cruz for a collection of watches, each celebrating a legendary graphic from Jim Phillips’s portfolio. Take your pick of the Screaming Hand, Roskopp 1, or the classic Santa Cruz Dot, each on Nixon’s Time Teller model. The styles featured in the limited collection are designed with an all stainless-steel build, and have custom dials illustrated with Santa Cruz graphics. Individual watches in the collection will retail for $125.00, and will be available in limited quantities exclusively at skate shops across the globe and online at Nixon.com.